Download your copy of this free report today! As collaboration moves from on-prem to the cloud, many organizations struggle with moving years of on-prem SharePoint infrastructure, customizations, and data. There is no accurate data as to how many customers are actively pursuing hybrid solutions as a strategy, versus simply displacing their on-prem environments. Additionally, there is no accurate data identifying and quantifying the gaps between existing on-prem deployments and SharePoint Online, and how many companies are impacted. Having clear data on these gaps will help organizations better understand adoption and engagement issues, and plan future SharePoint strategies. 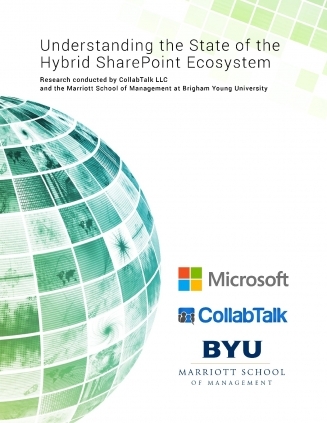 Independent research effort led by well-known author, technical evangelist, and 6-time SharePoint MVP Christian Buckley, Founder & CEO of CollabTalk LLC. The research was conducted by a team from the Marriott School of Management at Brigham Young University. Want to keep up on all of the latest CollabTalk news and updates? Subscribe to the monthly newsletter, and find out about community events, research projects, tweetjams, and great content!